An Honest Review of The NetGear N300 Router – How Does It Stack Up? Our Netgear n300 review is about where it can be used because not all networking solutions need to overflow with functionality, use core processors to maximize throughput or work across multiple wireless frequency bands to ensure brilliant connectivity. For small to medium houses that want to get the most out of speeds, reliability, and performance when it comes to their routers. The N300 optimal performance without all the added content; which means that it provides an elegant networking solution that can keep up with routers in higher price ranges that come with more functionality. Though perhaps the N300 is better suited to households with medium to low bandwidth needs and a limited number of connectable devices. We decided to make this Netgear n300 review because it has been praised for its reliability and substantial speeds considering its simplicity and price. Even without all of the additional features of routers in a higher price range. The N300 is still able to keep up with customers’ expectations. The amount of control that the router gives you over the network through the use of the genie app is also a highly praised function, with users being impressed with how easily it can be set up, as well as how simple it can connect to other devices. There are a few key features missing from this device, however. There is no beamforming which means wireless connectivity might be an issue for larger homes, and it only operates on a single wireless band, namely 2.4GHz. The device is also quite large, clunky and heavy for what it is, which might make it a problem for users who are looking for an unobtrusive device. However, all things considered, this router outperforms most of its competitors in its price-range, providing you with the same sort of functionality as more expensive modems. For small-to-medium homes, you’d be hard-pressed to find a better solution for the price. It is also covered by NETGEAR’s lifetime warranty, which means that in the unlikely event that it shouldn’t live up to its reputation for reliability, that you would be able to have it replaced or repaired with relative ease. For me, this router is ideal for smaller setups because it provides so much functionality, reliability, and speed at a fraction of the price. Sure, the wireless system may not hold a candle to more expensive models, but for your average home user (and perhaps even those looking to get a little more out of their router), this device is pretty much perfect. This product is better suited to users with low-to-medium bandwidth needs in small-to-medium houses. It supports online play and streaming admirably which makes it great for those looking to connect gaming consoles and smart TVs to the router. If you only make use of a limited number of wireless devices that stay within a medium range of the router, then you really don’t need much more than this. And if you are looking to extend your range, the model is commonly purchased alongside wireless range extenders to good effect. Those who are looking to connect plenty of devices to the internet will have a little trouble with the NETGEAR N300’s lack of beamforming, MU-MIMO, and dual-band technologies. In other, more expensive devices, these features allow for connected devices to perform at their peak, even where high-bandwidth is concerned. Those who are looking for a network solution that is intricate and set up in large areas, will likely not enjoy this product. There is also no support for USB, which limits functionality when sharing media across a home network. But considering the router is suited to smaller homes, this kind of functionality isn’t really necessary on it. 802.11n WiFi Technology, 300Mbps single band wireless on 2.4GHz allows for total connectivity in small-to-medium homes. 5 Ethernet ports (1 WAN and 4 LAN) with auto-sensing technology. Live parental control, double firewall protection, DoS attack prevention and exposed host (DMZ) allow for secure surfing and online play. Simple management, monitoring, and set up with the NETGEAR genie app allow for greater control and security over your network. QoS allows for the prioritization of bandwidth to gaming consoles, Macs, and PCs to allow for lag-free gaming and interruption free streaming. Wi-Fi protected access with WPA/WPA2-PSK and WEP encryption. The low number of ports. To minimize lags and interruptions, this model makes use of Quality of Service (QoS) technology that prioritizes bandwidth for online gaming and applications, Ethernet LAN ports and specific MAC addresses. This means that you can reserve your home’s bandwidth for those devices and tasks that need it the most to ensure that you enjoy interruption-free streaming and gameplay sharing, as well as near-zero lag during online play. With N300 Wi-Fi this device can enable download speeds of up to 300Mbps on 2.4GHz. In small to medium homes, this router will provide flawless connectivity to all of your wireless devices. These speeds are more than adequate for most packages offered to small-to-medium homes by ISPs. It means that your wireless devices will perform admirably and be characterized by high speeds and reliable connections in households that require low-to-medium bandwidth applications. As far as setup and management of the router go, the NETGEAR N300 makes accessibility and ease one of its main features. It is easy to set up on tablets, phones, computers and gaming consoles and also allows you to monitor, manage and repair your network from a mobile device using the NETGEAR genie app. ‘Push ‘n Connect’ functions also make it simple and secure when pairing wireless devices, while parental controls, guest network access and high-level security with WPA/WPA2 encryption. All of this makes securing your wireless connections and the flow of harmful content easy and convenient. 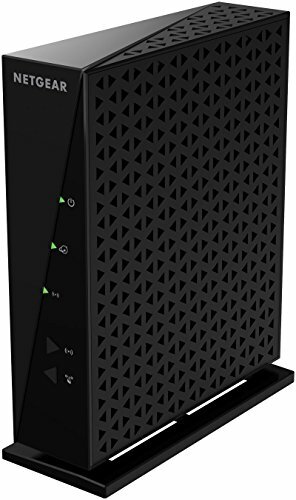 The Arris SBG6400 Gigabit Router comes packed with a small documentation flier, an installation booklet, a wall power adapter, a small ethernet cable, a stand for it, a warranty which is only available if you save the receipt and of course, the modem itself. However, all things considered, this router outperforms most of its competitors in its price-range, providing you with the same sort of functionality as more expensive modems. For small-to-medium homes, you’d be hard-pressed to find a better solution for the price. However, for the price, the Netgear N300 provides unbelievable speeds and reliability, is simple to use and will connect flawlessly with devices at a medium range. If you are looking for a small, cost-effective and elegant networking solution for your home, then the N300 might be just what you’re looking for. I hope you liked our Netgear n300 review.